An island icon, Captain Tony’s Saloon has an intriguing past – one that includes murder, mystery, and even a bit of mayhem. Before becoming a popular watering hole, the building served a few different roles. It was an ice house, the city morgue, a wireless telegraph station, a cigar factory, a speakeasy and even a bordello. It was also the original home of the famous Sloppy Joe’s Bar. It was 1865 when a tumultuous hurricane hit the Florida Keys and water came crashing through the city, smashing nearly everything in its wake. The city morgue that would later become Captain Tony’s was no exception to the devastation. The many corpses that were awaiting burial or autopsy were washed away except for one. History tells us that the one body recovered was lying in front of the building and was later buried beneath the building, surrounded by holy water, and enclosed by a wall where the poolroom now resides. Later, the local pub would expand, building around a tree that was once used for hangings. Many were lynched and hung from this tree, including a woman who murdered her two sons and husband. She was immediately hung in the blue dress that was covered in her victim’s blood. Many say she is the first ghost to inhabit Captain Tony’s. She’s been seen so many times that she’s referred to as the “Lady in Blue”. During the building’s construction, while removing old flooring, workers discovered the skeletal remains of several people and a grave marker of a woman named Elvira. It is believed that these may very well be some of the missing bodies that were lost after the hurricane. She had her infant child with her, and when discovering her husband drunk and carousing, she had a mental breakdown. She ran into the ladies room and killed her child then put the body under a blanket and left. And it is with these and other grim events that the Haunted story of Captain Tony’s Saloon begins. Many who’ve visited this legendary bar have experienced some sort of inexplicable encounter. Often, the events surround the ladies restroom where patrons have reported various mysterious occurrences. One woman reported that she tried to go into the first stall but it was locked. When she went into the second stall, she noticed that no one was in the first. Before leaving the bar later that evening, she went back in only to find the stall still locked; and before she knew what was happening, the outside door to the restroom opened and closed; although no one could be seen. When she went into the back stall, she heard the door of the first stall unlock and slam. Alarmed, she jumped up to see what was happening and still no one was in sight; and the first stall was again locked. One night alone, around 4am, Joe heard a voice calling out to him. He got up from his desk to investigate but saw that no one was there. He walked to the back of the bar and noticed the back doors were wide open – even though he’d locked them hours before. Unable to explain the voice he heard, he simply brushed it off – until a few years later when the same voice called out to him again. This time the voice said: “Don’t leave.” Joe ran to check the back doors and this time they were locked. He found nothing out of the ordinary throughout the bar so he went home. Hours later, around 6am, Joe got a call from the police saying they found the body of a young teenage girl in front of the bar. It seems she called her mother just after overdosing on pills to commit suicide. Her mother called the police and later they found her body in front of Captain Tony’s. Joe believes the voice was telling him to stay – that he might have been able to save that girl’s life. Only that spirit knows for sure. Many other bar patrons have described similar and strange experiences: Cold spots in the hallway near the ladies restroom, doors opening and closing without anyone around, stalls locked with no one inside. 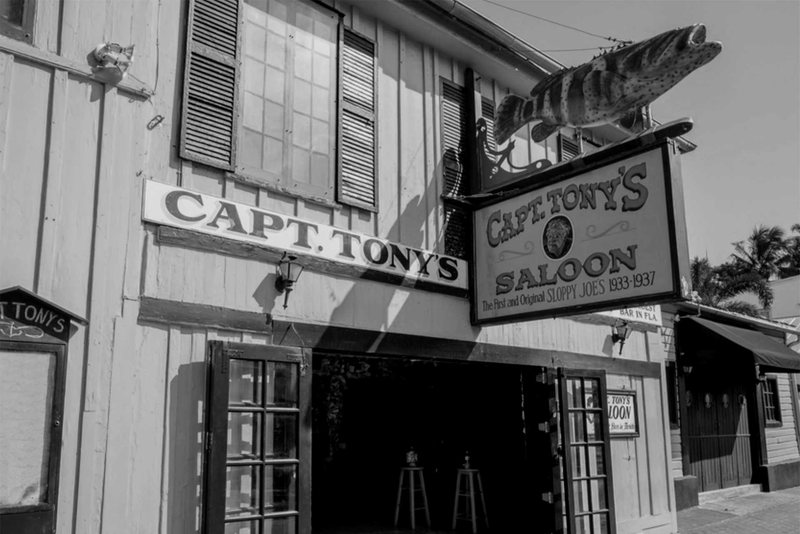 If you’re in search of paranormal experiences, a visit to Captain Tony’s Saloon is definitely in order. There’s little doubt that the lost and tormented souls of several people still linger in the pub. Or if you are able, take the Ghosts & Gravestones Tour which will give you a chilling and thrilling experience of walking amongst the dead at night – the most opportune time to have a ghostly experience.